My girls LOVE horses. Love them! The oldest started asking to ride a horse at around age 3, brainwashed her sister, and the mania has yet to leave our household. This same oldest child of mine hates math, and has had a terrible time memorizing math facts. We've done worksheets, copywork, flash cards, Math Shark, Little Professor, computer games, board games, and sing-a-long songs. I even snuck a math game onto her Amazon wish list for her Nintendo DS, which her grandmother purchased, and said child hated. She just hasn't been able to get her math facts committed to her long-term memory. When the opportunity came to review Math Rider, I was cautiously optimistic. The horse part sounded good, but after all our other trials and failures into the world of math fact memorization, I just didn't see how it could be any more effective than the other things we'd tried. Still, it involved horses. There was a glimmer of hope. The program is aimed at children ages 6-12, or older children who still need to master their math facts. The game accommodates up to 8 players. Thomas Brand, the creator of Math Rider, developed the game because his own children were struggling with math. Wonder of wonders: It has been easy (gasp) to get my girls to practice their math facts. They *like* it. I never thought I'd be able to say that! My math-loving daughter has already made her way through most of the levels on all four operations. My math-hating daughter is taking a slower pace, working on the easy levels first, and getting ready to move on. They have both shown improvement when I've worked with them on their math. Each operation (addition, subtraction, multiplication, division) has four levels, from "Easy" to "Master." Each level involves a different quest. For example, the "Easy" level involves the rider's mom having the flu, and the rider is told they will have to fix all meals until their mother gets better. The only cure is the Pythagoras Flower, so the rider sets off on a quest to find it. The four quests are the same across the operations, with a different reward for each quest. There are thirty questions, and thirty jumps, for each section of a quest. Each level requires a certain number of points for completion. The Easy level requires 500 points, Medium requires 750 points, and so on. You do have to complete each quest before moving on to a new one, which makes sense. You can't start doing addition and switch to another operation before your current quest is completed. I signed myself up as a player so I could understand how it works. The game controls are simple, which is a deliberate part of the design - Mr. Brand did not want to see a child unable to succeed because of the game controls. When you're answering questions, you use the number keys on your keyboard to type your answers in, and then hit "Enter." When you answer correctly, your horse goes over a jump. If you enter your answer correctly, you hear a note or a "star" sound. If you answer incorrectly, your horse snorts, and you can re-enter your answer. If you hit a key by mistake, you can hit "Delete" and re-enter your answer, as long as you can do it before your horse gets up to the jump. You can pause the game by hitting the Escape (Esc) key, and turn the music on or off by hitting the "M" key. The program is "smart," so it adapts to each player. Each student practices the problems they don't know as well but not the ones they have mastered. Each time you complete a portion of the quest, you see a screen that shows whether you've answered the questions correctly or not. There are green bars indicating correct answers, and yellow and red bars which indicate slower or incorrect answers. There is a statistics screen where you can see your overall progress. The program uses Adobe Air, which means it runs on both Windows and Mac operating systems. This was a huge point in its favor, as we use Macs at our house, and so many programs are written for only Windows. You can see the complete list of system requirements here. My children enjoy the game, so it's easy to get them to practice math facts. The positive reinforcement when they complete quest, telling them they are a "master of addition," etc. Although you can turn the music off, you have to turn it off each time you play a new section of a quest. I would prefer to turn it off, and then opt to turn it back on myself. I did mute the computer, but then I couldn't hear the horse snort when I answered incorrectly. At the end of each section, you have to watch your points count out. I would love a way to be able to skip over that. My child who "doesn't like math" is simply a child who struggles with it. This game has been so good for her, because she wants to play. What she needs most is consistent practice, and she's getting it now, and I don't have to make her do it. That, I believe, is the key. While I am not always an advocate of more screen time, in this instance, I will make an exception, because I can see how much it's helping her. 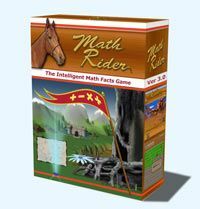 Math Rider is available as an instant download for $47, which includes free software updates for life. If you would like to try before you buy, click here for a free 7-day trial.